Il Vecchio is a Rüdiger Dorn design, published in 2012. Although designed by a major player in the gaming community, it didn’t seem to gain much traction in the market. You don’t see it played that much even though its relatively high rating of 7.16 on BGG would initially seem to indicate that it would be common. The game doesn’t fit cleanly into any one broad mechanic featuring working placement, set collection, area majority, variable powers, point to point movement, etc. The two-sided board features a map of towns connected by roads and grouped into regions numbered 2-12 but no region numbered 7. 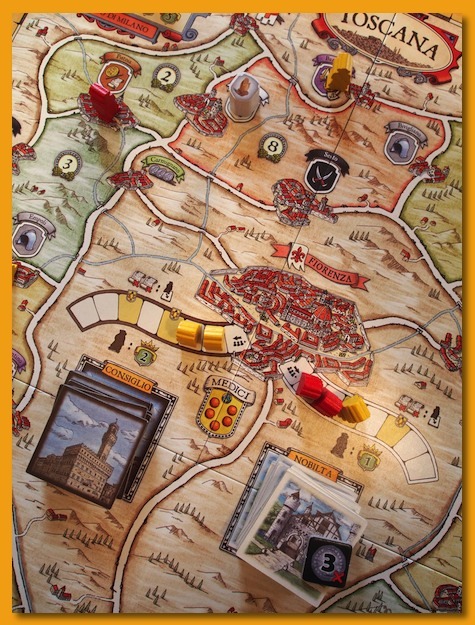 Six towns lead directly to 4 special regions where players can score points and gain advantages, three towns represent the only path to the region of Florence, and the other three towns each represent the only path to a connected region considered outside the map (at three corners). The two sides of the board differ in coloring but are otherwise identical. The towns are marked with a special ability to produce a good in one of the 7 types (coins/scrolls, helmets, hands, swords, or bishops/carriages). Each type of good has one specialized middleman pawn of a matching type that move around the board into towns that match the type of good the town produces. Players work through a number of rounds to gather goods of various types in order to eventually move into one of the previously mentioned 4 special regions to cash in goods to score points and gain advantage. Turns are fast with little down time. Each turn, a player takes one action (gather goods, add a worker, reset used workers, or take over a region). 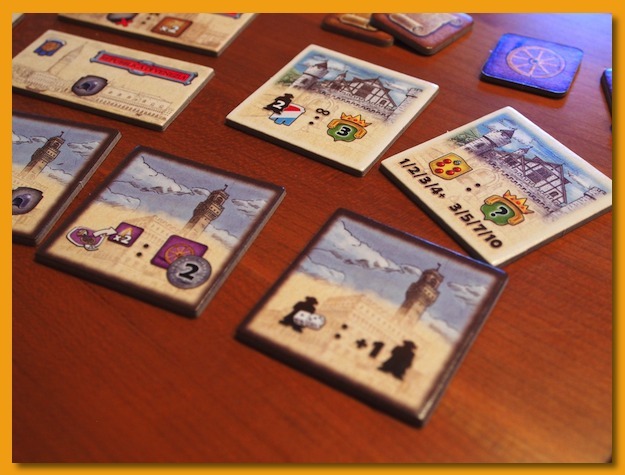 When gathering a good, a player chooses a worker in a town (or optionally moves a worker to a town for a movement cost – coins or carriage token), and gathers the good the town produces. If the town contains the middleman pawn, the middleman automatically moves to the next town of the matching type. If the town does not contain the middleman, the player must pay a bishop token to take the good. After taking the good, the worker is considered “used” and is placed on its side. If the user plays a bishop token the middleman doesn’t move to the next matching town and the worker stays upright and isn’t considered “used”. If the player chooses to add a worker, the player rolls two dice and places a new worker from their supply into one of the towns in the region indicated by summing the two dice. If the player chooses to reset their workers, all “used” workers are placed upright and the player takes a coin. The final option for each player is taking over a region. To take over a region, a player must move an existing worker along a road for a cost and then pay a cost of goods to place their worker into the next free spot on a region track. The placement of a worker is permanent but the benefit is in scoring points at the end of the game and one of the tiles stacked in the region. The 4 special regions are broken into two broad categories: the outside regions and Florence. The outside regions each require one or more hand, helmet, or sword goods and some coins. The earlier you move into the region the better coin to victory point ratio you earn. Each region provides a rectangular tile of your choice that grants you a one time benefit (e.g. “use” this tile to gain a single helmet, hand, or sword token). The Florence region, although similar to the outside regions, works a bit differently. You take over a spot on the region tracks in the same fashion, paying to move a worker from one of the 3 towns that lead into Florence, but once there, you must decide which of two region tracks you wish to place your worker onto. 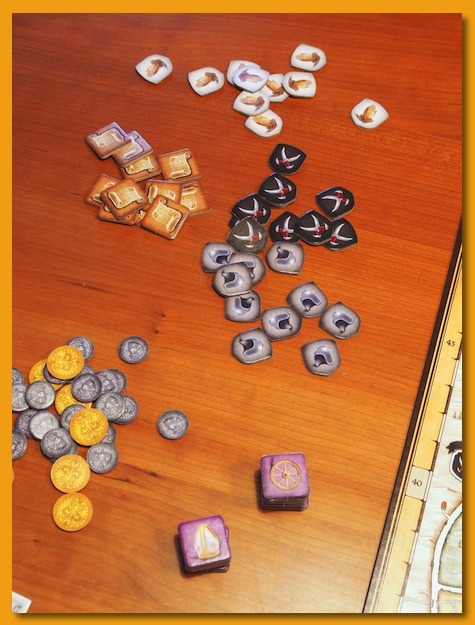 The left track costs two scroll tokens, grants the player 2 victory points, and provides a choice of one of the top 5 tiles for a tile that grants a special power (e.g. every time you take a helmet, you get 1 extra helmet). 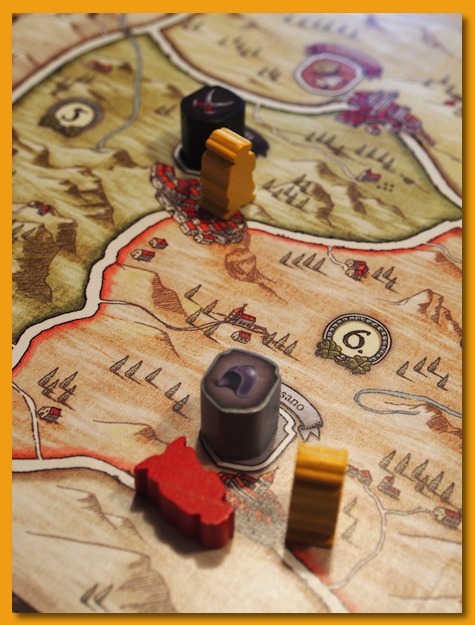 The right side track also costs two scrolls but grants the player only 1 victory point and their choice of one of the top 5 tiles for a tile that provides a benefit for meeting some “end game condition” (e.g. gain 2 victory points for every 2 workers in the outside regions). At the beginning of the game a “x3” chit is placed on the special power stack of tiles in Florence. When the player chooses this track to place a worker, the player must pay 3 coins in addition to the 2 scrolls. 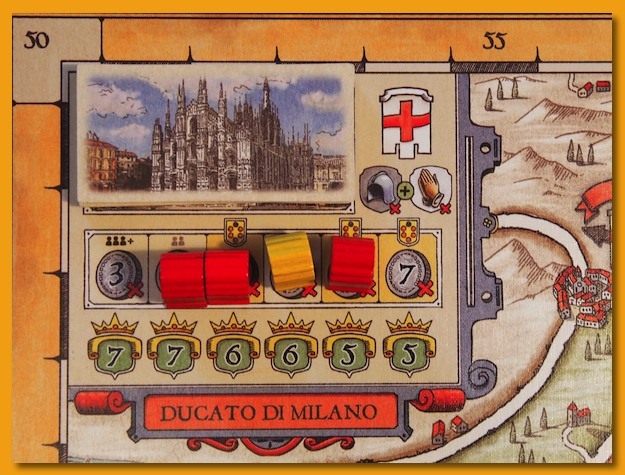 In the center of the board, is a stack of “Medici Crests” and as the game progresses, the placement of workers triggers crests to be taken. Each crest gains the player 1 victory point but also triggers a negative event that all players must carry out (e.g. give up a token of some sort). The first Medici Crest taken also moves the “x3” token from the special powers stack to the “end game condition” stack of tiles making those tiles more expensive. The last crest taken triggers the end game. So, although from a high-level, the game is basically a “pick up stuff” and then “cash it in for points” and then “add in other points for special stuff” kinda game, it does have its interesting twists. My wife isn’t sold on it after a few two-player games saying she doesn’t like games where she can’t envision how she’s doing throughout the game. She tends to always think she’s doing poorly even when she’s not but this one tended to confuse her. Turns are very fast so I appreciate that. The dice roll on placing workers is a bit random (rolling a 7 allows you to place it wherever you want) but the game does come with variants to ramp up the strategic aspects. However, I’m not sure the design would benefit from making it more “thinky”. Overall, I like it and think it would go over well with light to medium gamers or for that late-night slot as you wind down the evening of playing some meatier fare.